Descriptions for each piece below the gallery. Mixed media based on the article “Spring Tonic” on page 10 of Hygeia for April,1923. Single sheet book printed using hand-set type and antique Austrian wood engravings on 11″ x 17″ Mohawk Superfine paper. “Facts About Cake You Should Know Now” is an advertisement in the magazine Hygeia, 1942, from the Department of Nutrition and the American Institute of Baking. 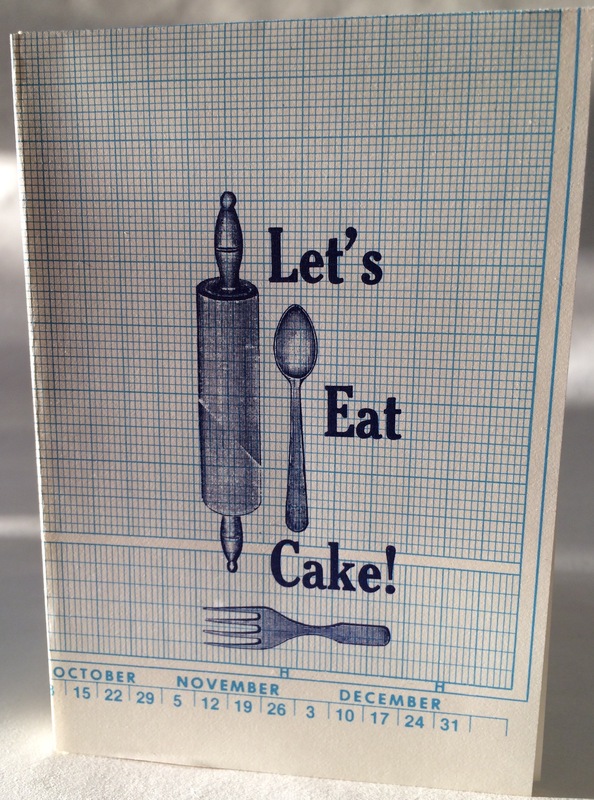 In the ad, the booklet “Cake Parade” was available for free by writing to the offices at Rockefeller Plaza. I bought a copy on Ebay and took the text headings from each page to make my book. 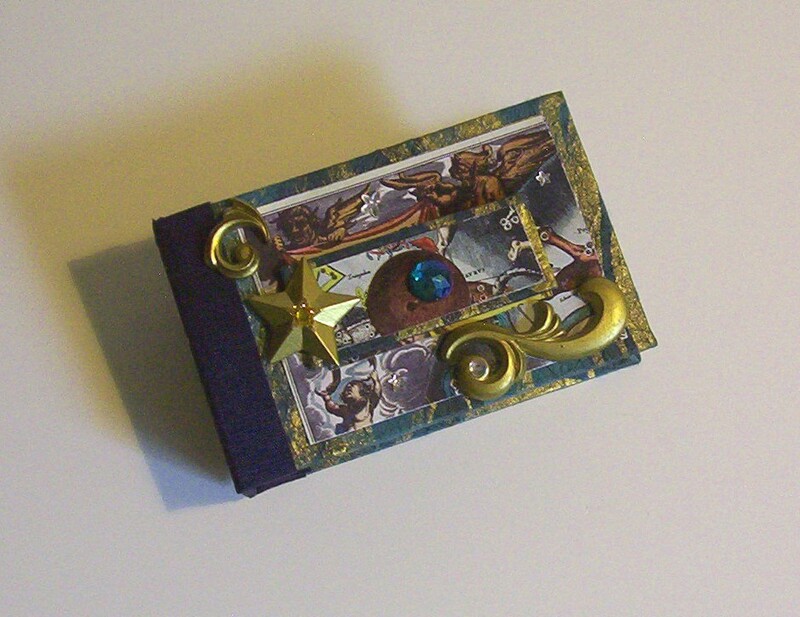 Collages made from Hygeia magazines in a pleated spine with pockets binding. 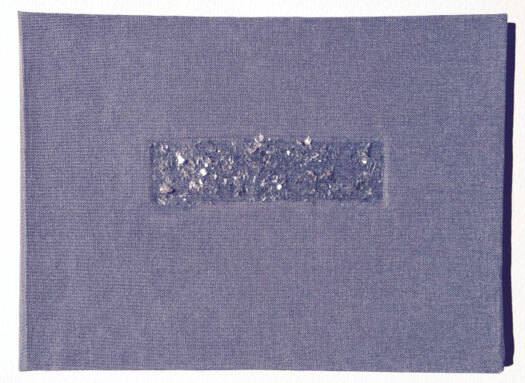 Book cloth, bristol board, tyvek, acrylic, magazine pages, PVA. Sixteen collages created from pages in selected months of the bound set on eight folded, double sided panels, held in pockets created by a pleated spine fold that was probably developed by Hedi Kyle. End pages feature additional images from the magazine’s full color covers. 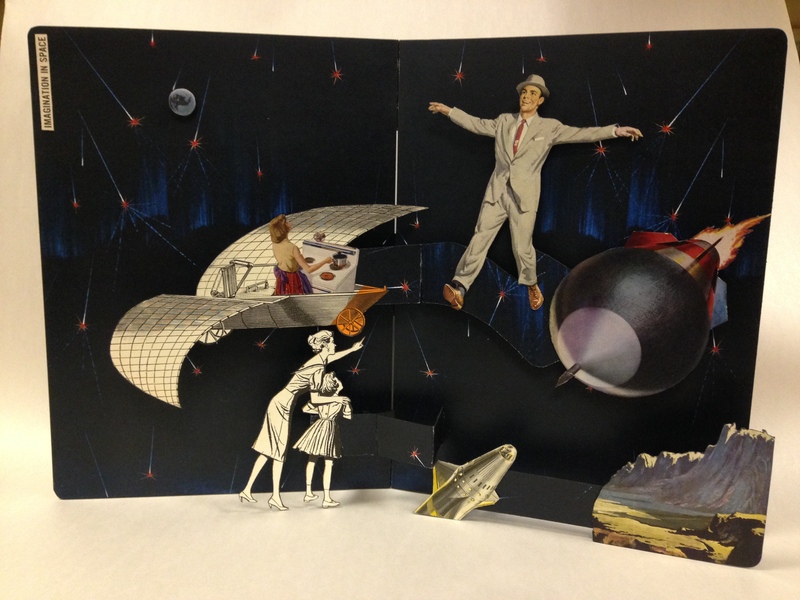 The collages can be removed from their pockets for independent viewing or rearranging. 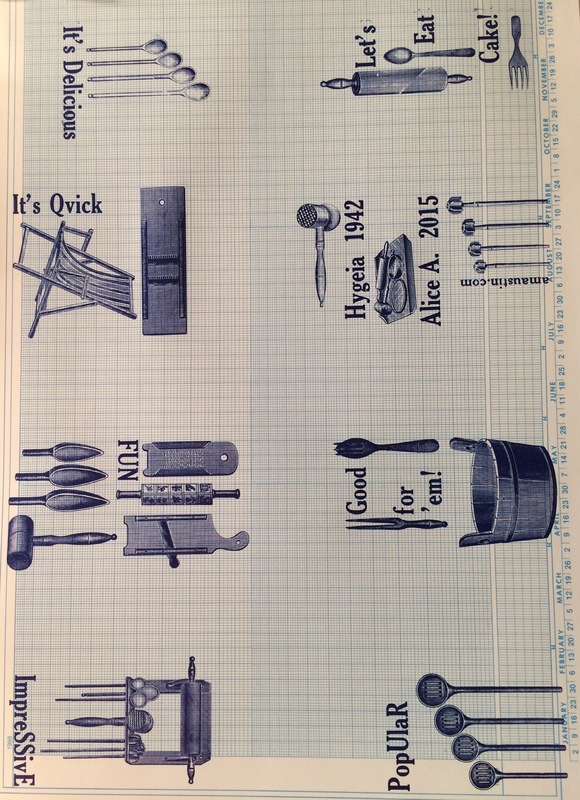 From: Hygeia, 1926, 1928, 1941 & 1946. Covers, pastedown and flyleaf’s from the bound volumes. 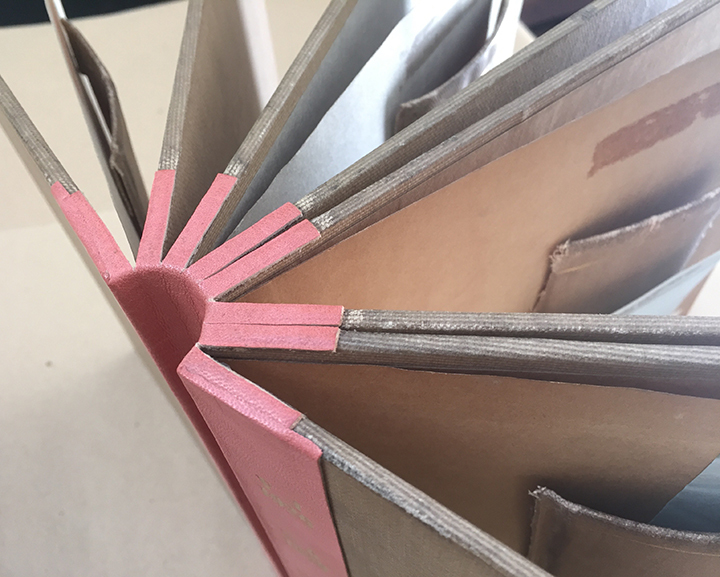 Mongolian board binding, pink goatskin, and shoddy gold stamping. I had a feeling that all the crappy library bindings would find their way to the receptacle of doom. I decided to save a few. Repurposed magazine pages, linen thread. My 93-year old grandmother folds kusudamas (medicine balls) for all her children and grandchildren to have in their homes. It’s an auspicious charm, and we all have the same ones made by her. I wanted to be sure that I could make them too, the same way. 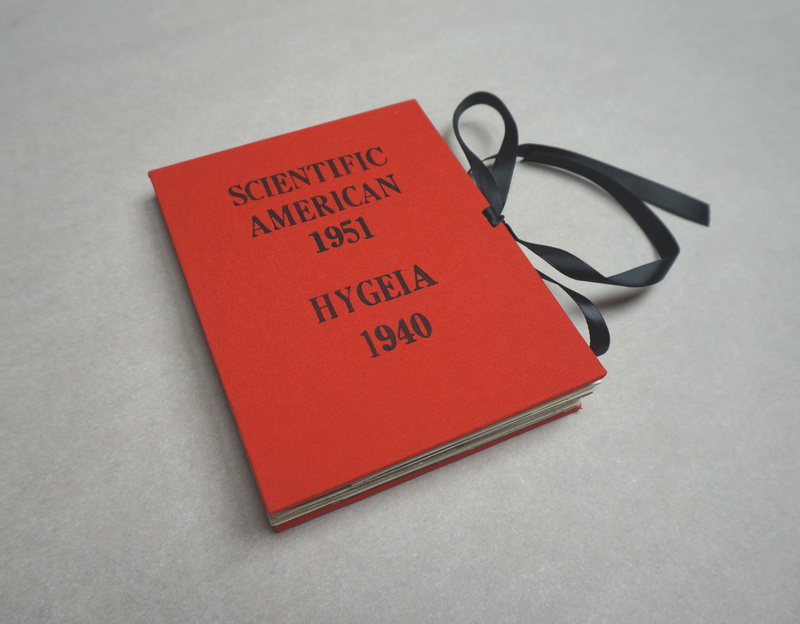 The magazine pages from Hygeia, 77 years aged, are perfect in that they are brittle and will fall apart when played with or hung on display for too long. 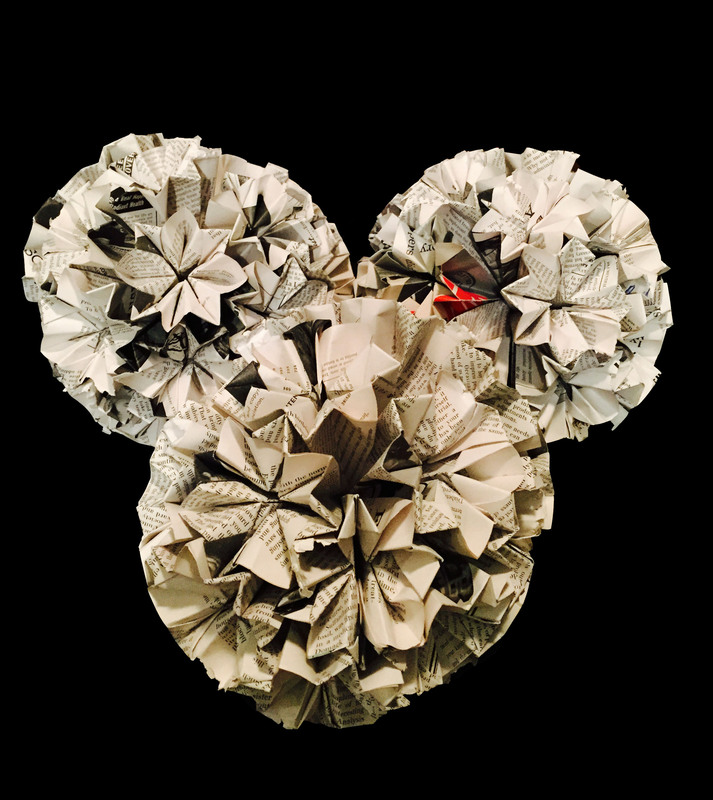 That is no worry because of the design of the kusudama. 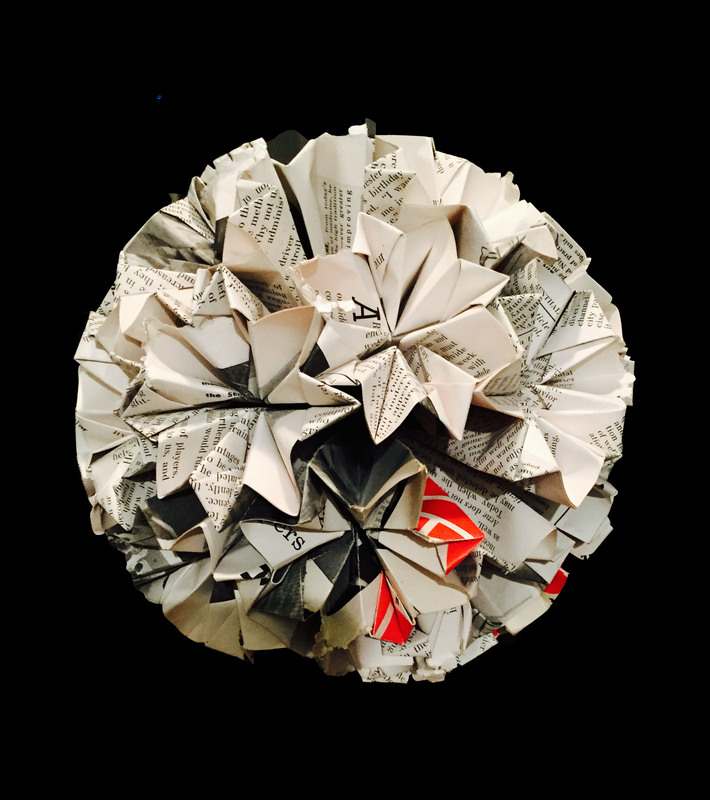 The power of the kusudama lies in its simplicity – in making and in giving. 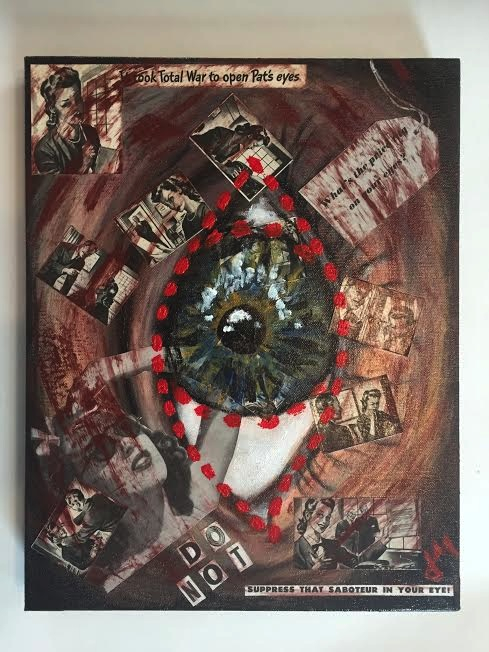 Water based oil paint, acrylic paint, acrylic medium, and paper on canvas. I took parts of advertisements in various volumes of Hygeia, 1943, which centered on keeping your vision sharp for the (world) war (II) effort. 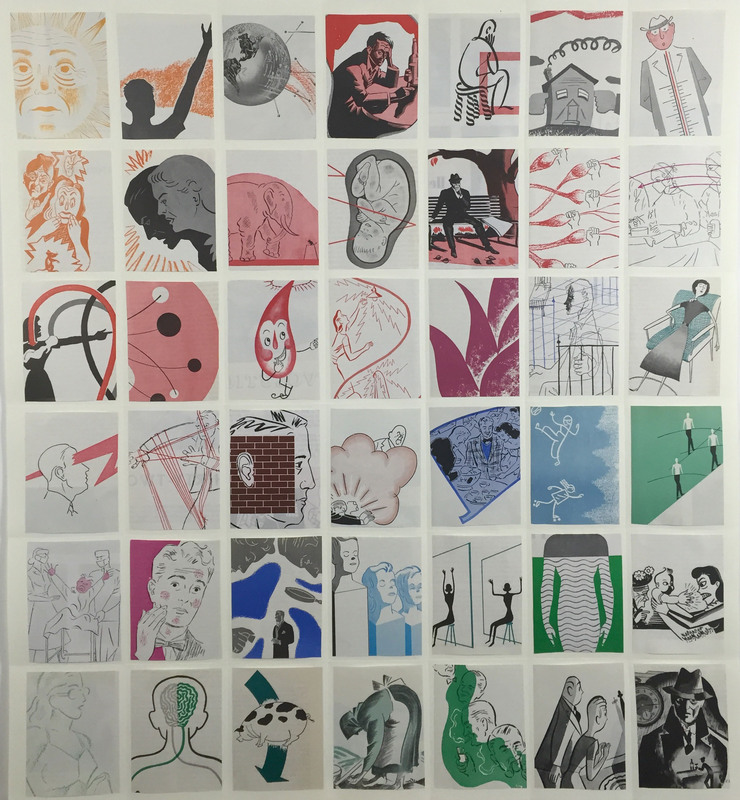 By removing the words, rearranging the images, and combining with original artwork, an alternate narrative emerged. I was very taken by the illustrations for the articles in Hygeia. The designs and colors are very evocative of the time period and I like the way they look cropped and juxtaposed next to each other. Cardstock & decorative paper, gouache and Hygeia magazine images. In 1924, Hygeia, a family health magazine published by the AMA, advertised an invitation to high school readers to submit designs for Health Posters. They received hundreds of responses from students around the county. Throughout the year, images of these posters were reprinted in black and white in the magazine. 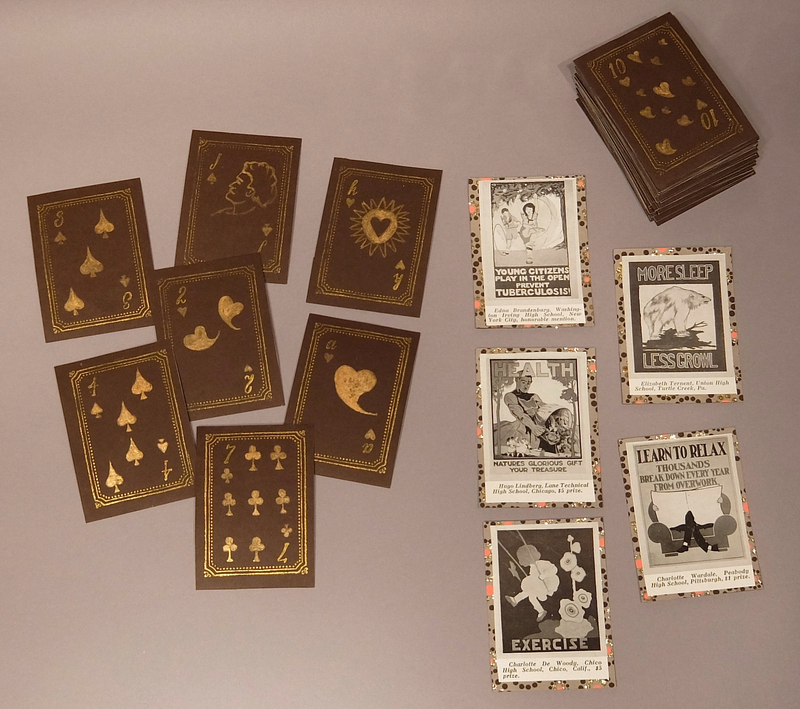 This deck of cards has the original reprints of these posters from Hygeia on one side and hand stamped & hand painted card symbols & characters on the other. Also printed on the poster images are the names & hometowns of the high school students who created them. The biosphere is the theme of the Scientific American September 1970 issue. The articles throughout the magazine explore the beauty of the world with micro and macro views of nature. I was enthralled with the images being shown. Only after spending time with the magazine did I notice that the ads repeatedly brought up the degradation of the environment and how corporations were trying to solve the problem. I chose to focus on the positive and create images that celebrate the beauty of the world with the hope that the power of nature will overcome the thoughtless abuse of the world by man. I hope I am not deluding myself. 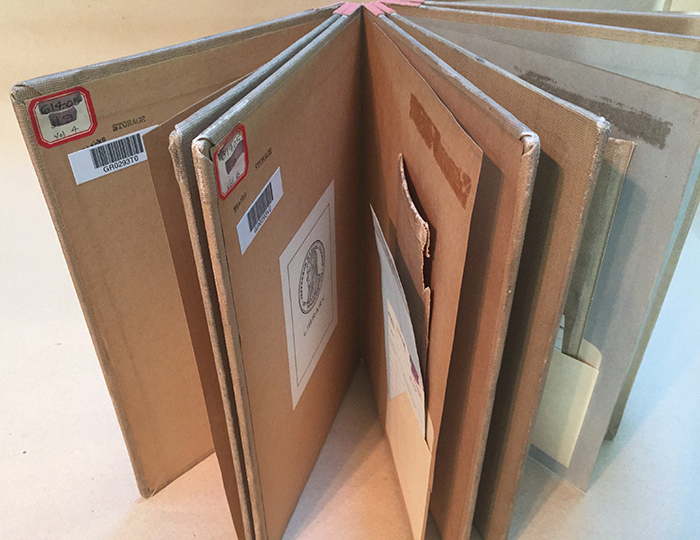 Binders Board, book cloth, cardstock, mirrors, plastic, paper. T R A V E L is a Turkish map fold structure that stands independently so that the viewer can see two distinct layers of images of the heavens. The first layer is comprised of images from NASA’s Hubble telescope which hovers above images of 16th century celestial/astrological maps by Andreas Celarius. The one collapsible leg has an acrostic poem entitled T R A V E L by poet, Nancy Scott of Easton, PA. This book demonstrates the history and cosmology of the heavens through the artistic and scientific eye of humanity. 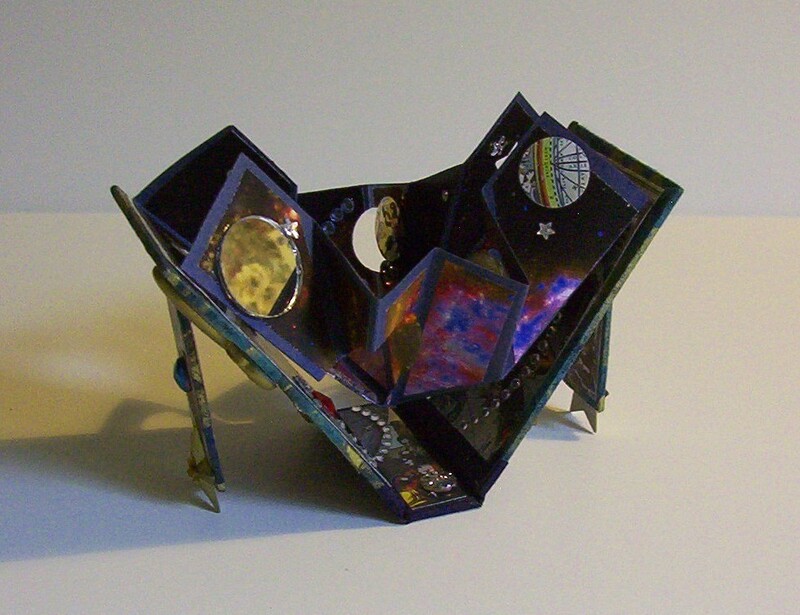 Accordion Book: Paper, book cloth, board and ribbon. 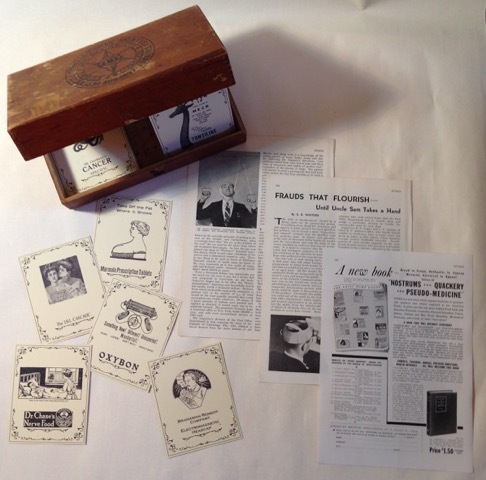 This book features five vignettes compiled from various advertisements and article images. These vignettes explore how we relate meaning to images, and how taking a photo out of context can entirely change how the viewer associates with it. 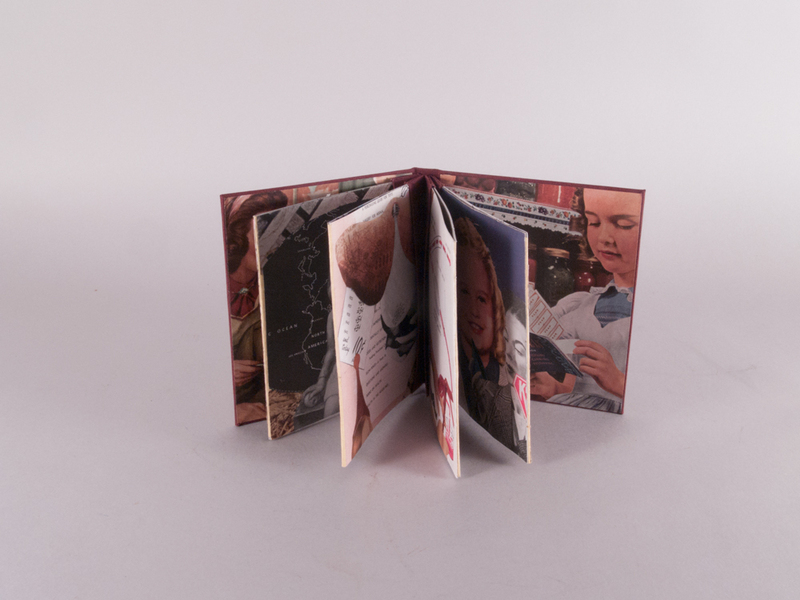 One of a kind expandable accordion book enclosed within the Scientific American binding. Magazine pages, bound Scientific American magazines and Xerox Transfer. 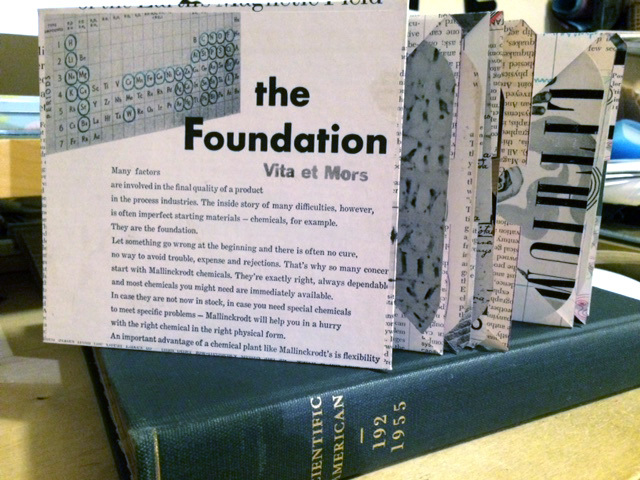 Vita et Mors is a dos-à-dos one of a kind expandable accordion-fold book enclosed inside the complete structure of bound Scientific American magazines. 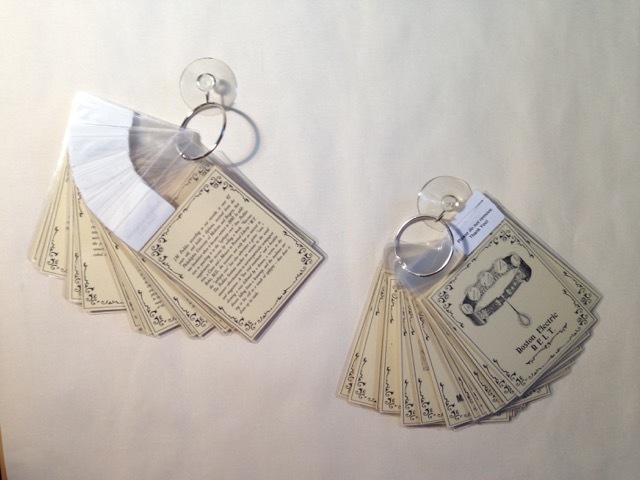 Within the pages of the book are pockets that hold image cards with facts about Vita et Mors (Life and Death). Definitions are from Webster’s on line and facts are from various medical and informational websites. Quotes are from the writings of Langston Hughes and Lao Tzu. The color of the magazine is what struck me first – the striking shades of red, black and white. The abstracted collage is a composite of different text and images extracted from the magazine, (cut into tiny pieces) and put back together again. 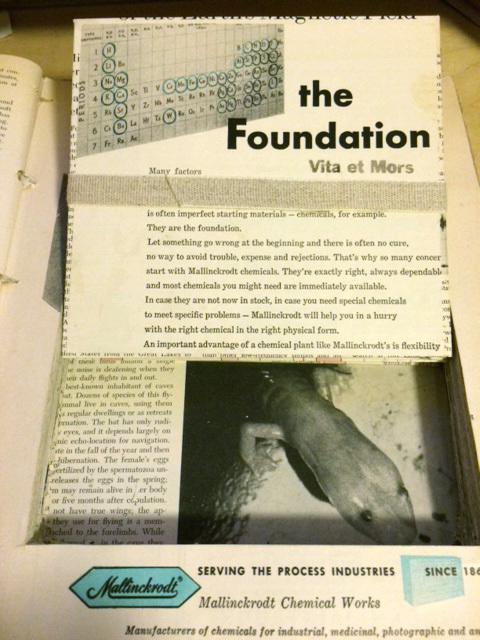 Box made from paper, board, LED lights, and Vivak containing assorted ephemera and a tunnel book made from Vivak and transparencies. In 1936 American industrialist S.H. Camp, founder of Camp Scientific Corsets, commissioned the first Woman of Glass. 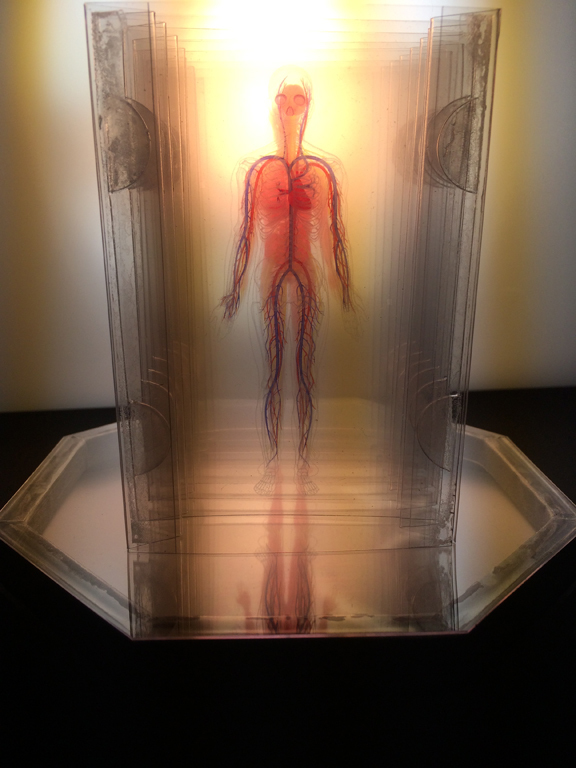 Franz and Fritz Tschakert, preparators for the Dresden Hygiene Museum, made the Transparent Woman. The Tschakerts modeled figures around a statistically average human skeleton, and positioned them in an orant pose. The shell of the body was made from Cellon, an early plastic. 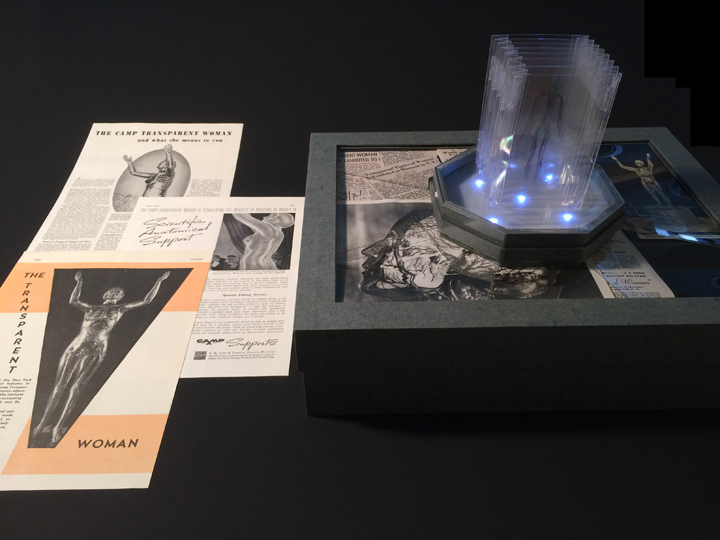 Transparent Woman was first exhibited at the Museum of Science in New York. A nationwide tour followed where a physician who presented educational programs accompanied her. Over twenty million people viewed her by 1950 and she became the cornerstone of Camp Scientific Corsets’ advertising campaigns. 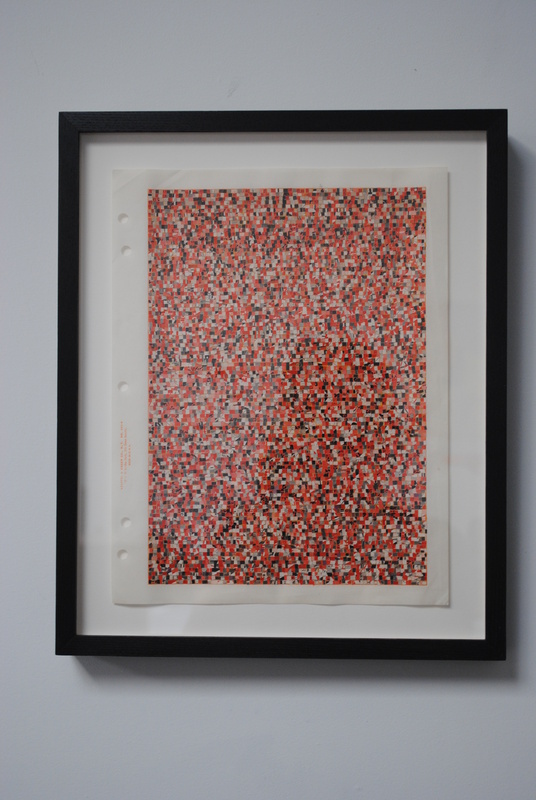 I chose a Scientific American volume from 1967 to make an accordion fold painting as a tribute to James Rosenquist’s iconic work F-111 (1964). The advertising and article images from the volume inspired me to integrate them with a background image of a Titan II vehicle as Rosenquist did with the F-111. The work was done with watercolor, acrylic inks, colored pencil and marker on paper. 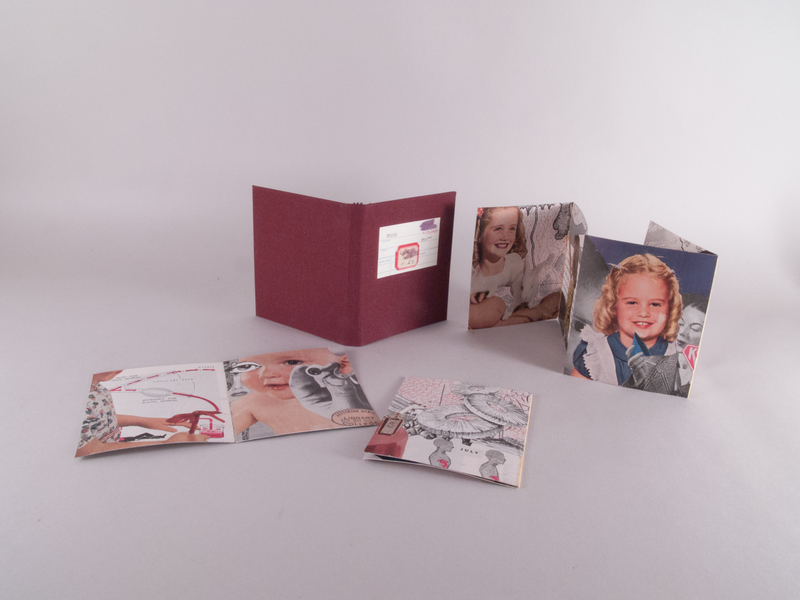 The case for the work contains the source images from the magazines. 1968 was a year before the landing on the moon. Space exploration was on everyone’s mind. There were so many unknowns. This pop-up tries to capture the wonder of time.